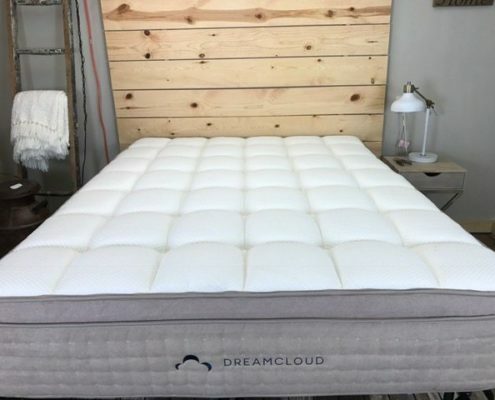 If you seriously consider buying one, read our unbiased DreamCloud Mattress review below to help you decide if it’s the right mattress for you. Check them out! 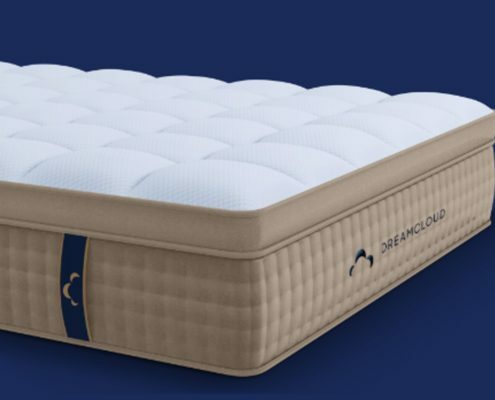 Representing the latest in hybrid mattress technology, the new DreamCloud combines traditional springs with multi-layers of foam, latex, gel and cashmere to offer a premium bedtime experience. Getting a good night’s sleep should be the least we could ask for, but in today’s fast-paced society this isn’t always a given. Our constant striving for better sleep has driven advancements in mattress technology at a rapid rate, as manufacturers try to find the perfect formula. Recently dropping onto the online market, the DreamCloud comes with an evocative name that sets high expectations, and is armed with a checklist of the latest in hi-tech bedding materials. The right mattress stays in your home for longer than most pieces of furniture, and it takes time and fore-knowledge to make the right decision. 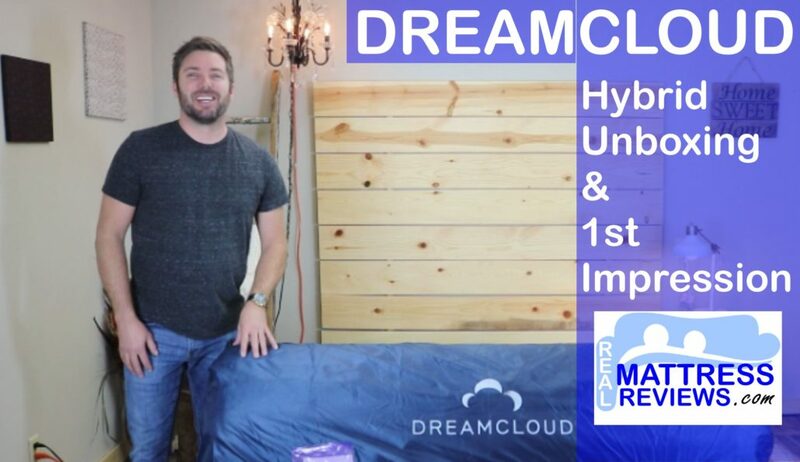 To save you time, we’ve put together an in-depth review of the DreamCloud Hybrid mattress. We will break down everything you need to know, and equip you with the knowledge required to make the right choice when it comes to a luxury, modern mattress. Aside from the hand-tufted stitched handles, a few highlights of this mattress includes flax yarns, cashmere, and it has a 365 night trial period in case you decide to return it, and of course, a reasonable price to boot. 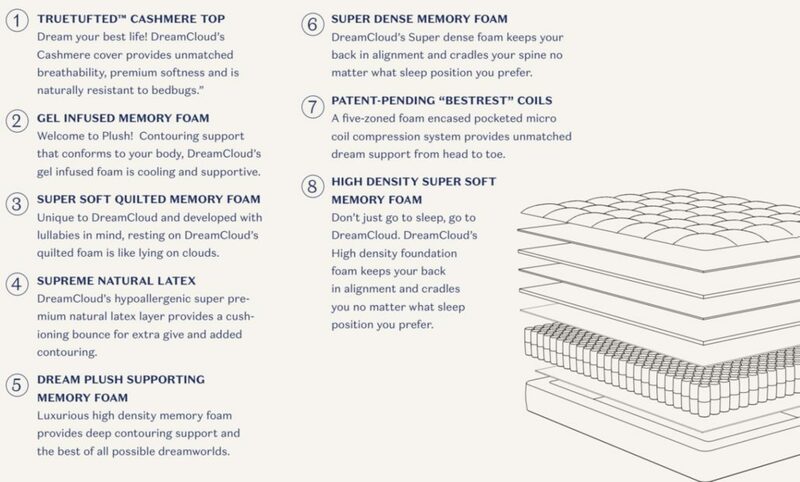 DreamCloud has been engineered with 8 distinct layers of handcrafted super premium materials to envelop the dreamer in a plush, pressure free, and dream-filled sleep. 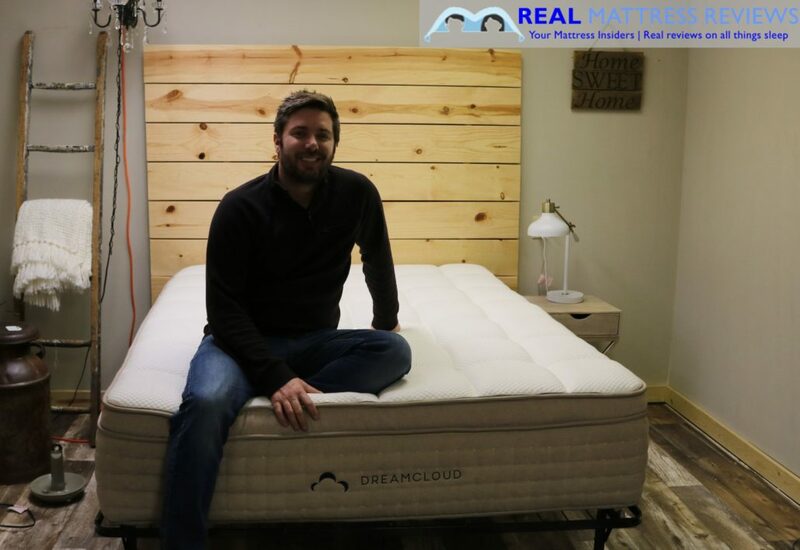 The DreamCloud is a much more firm mattress compared to the 10″ beds you can find and purchase online for a reasonable price. Spend your money wisely and buy a real luxury mattress. 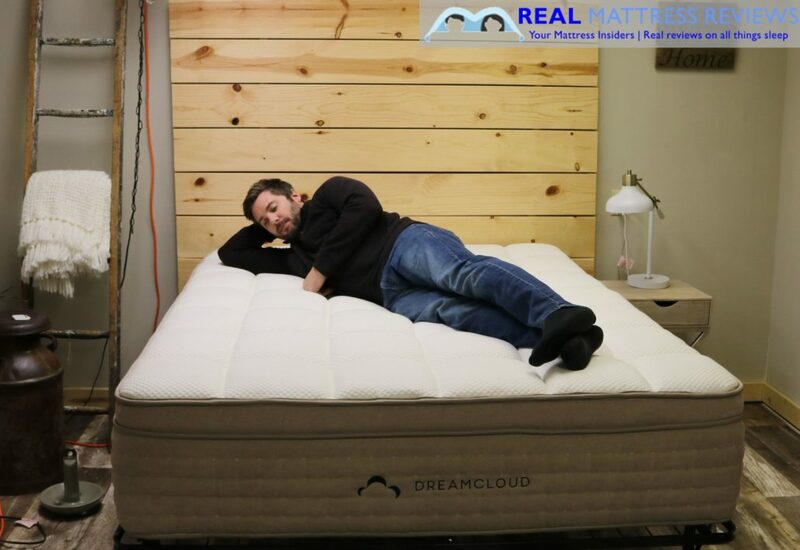 Some companies say things like “in store this would cost $3000”, well that’s actually true with the DreamCloud as it’s a well-built luxury mattress. The design of this mattress has an authentic traditional feel which utilizes a pocketed coil unit and a nice quilt on top. Thus, it’s a good combo of foam and mattress feel. Want a good combo of bounce and pressure relief. 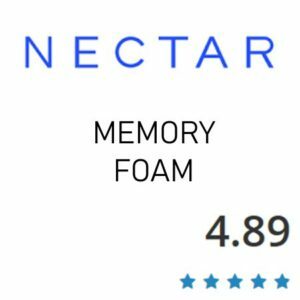 The pairing of memory foam, latex, and the pocketed coils gives you good pressure relief with the memory foam with an added bounce. It has a right balance of firmness and softness. The DreamCloud had no issues at all with overheating. Being that it uses latex and gel-infused memory foam it does not trap heat much at all. Additionally, since you do not sink super far into the mattress, more of your body is exposed to the air vs being engulfed by the mattress. Some brands compromise quality and focus more on price. But it’s not the case with DreamCloud. 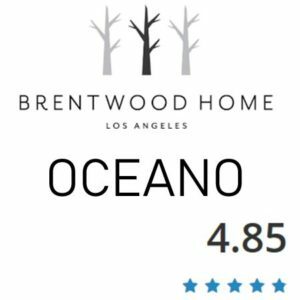 It makes quality mattresses with fair and relevant pricing. You get more of what you paid for. It’s a real luxury mattress with a reasonable price. This mattress works well with different sleeping positions and the firmness appeal to most people. Although you will not have to worry about the sheets, you’ll have to look somewhere else if you like a thinner mattress as it is about 15″ thick. The DreamCloud Mattress renders a more traditional feel than an all-foam mattress will. It also has more bounce. Hence, if you prefer all types of all foam, it will not change your mind. Although this mattress is not firm, it’s not super soft either. It’s a balance of both. Delivery of the DreamCloud mattress is FREE! It is compressed and roll-packed into a cardboard box before being delivered straight to your doorstep. It usually takes 8-10 business days from the time you buy until the bed arrives (but it could be sooner, depending upon your location). Once you receive the mattress we recommend bringing it to the room you want it in before opening it. After it is in the desired room remove it from the box using scissors to cut the plastic – but be very careful not to damage the fabric of the bed when you do so. Once the plastic is cut free you can watch your bed expand! It will be fully expanded within 24 hours or so, but you will be able to sleep on it before then. DreamCloud take the delivery service one step further with their White Glove delivery service. They state on their website that they will hand deliver the mattress to your desired room and set it up for you. They will also clear up all the packaging, and even remove your old mattress so you don’t have to. With their free delivery and commitment to doing the heavy lifting for their customers, the DreamCloud gets full marks in this section. As the DreamCloud is opened and starts expanding quickly you will only notice a slight ‘new mattress’ smell. ‘Off-Gassing’ to me is a slightly misleading term, because no matter what brand you are looking at, they are going to have a smell. Natural and organic mattresses often times have the strongest smell, even though people associate them with no gassing. A smell is normal and no matter what brand you buy there will be some smell. I associate it with a new car or a new shoe smell. In most cases the smell will either be gone or very faint within 12-36 hours. I would recommend using a mattress protector; so once the mattress airs out you should apply your protector under your sheets, and by then there should barely be any smell at all. For maximum effect, stand the mattress up on its own to allow it to air better, but at the end of the day, the ‘new bed smell’ is just a normal part of buying a mattress. With that said, the compartmentalised, hybrid design of the DreamCloud actually results in less off-gassing than typical, modern memory-foam mattresses. The DreamCloud mattress is already impressive enough with its whopping 15 inches tall profile, that of which is exceptional for a mattress. 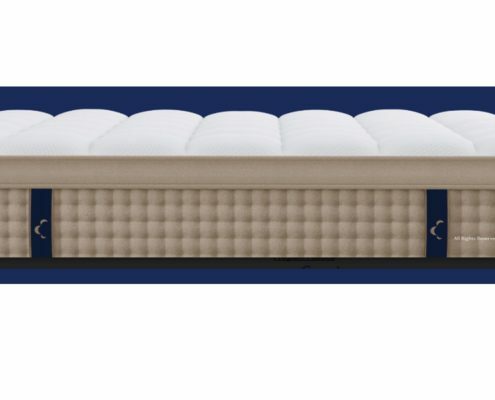 Its eight-layer construction comprises of wrapped coil components and foam, which seamlessly to provide the sleeper with a comfortable pressure relief and firm innerspring lift. This layer is 2″ of TrueTufted cashmere top cover that provides comfort and the luxurious aesthetic to the mattress. 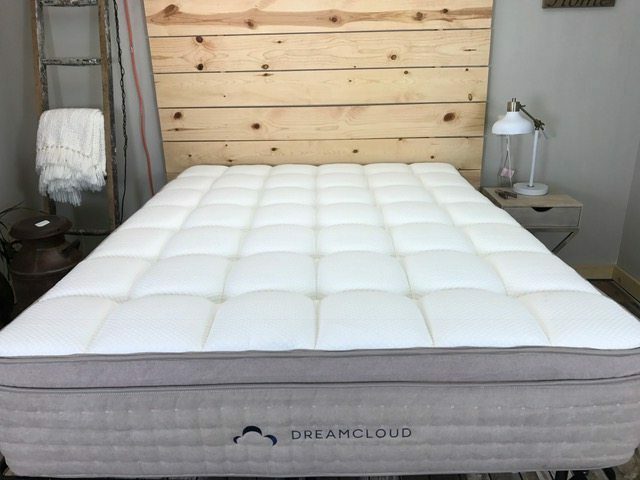 The DreamCloud is hand tufted which is something that you usually find in mattresses costing 3 or 4 times more. This layer is .5″ of Gel Infused Memory Foam that provides a cooling effect to the top layers of the mattress. This 1.75″ layer of soft Quilted Memory Foam designed to provide pressure relief and comfort. This layer is .5″ of natural hypoallergenic latex designed to provide bounce and contour. This .25″ layer of DreamPlush supportive memory foam that provides additional body contouring. This layer .5″ of DreamPlush is a high-density supportive memory foam that works to provide a transition layer between the upper comfort layers and the lower coil support layer. This layer is an 8″ high-quality steel pocketed innerspring coils with 5-zone layers that provide exceptional support to the body. It has a varying stiffness that depends on the zone which gives you the support where it is needed most. This layer is a final 1.5″ of high density extremely soft memory foam that provides the foundation layer of the mattress with deep compression support. DreamCloud’s cashmere cover is breathable, soft and is tufted into the other layers to prevent bunching. The manufacturing of DreamCloud mattress can be considered as artisanal. Artisan stitchers hand-anchor a EuroTop to dense foam base by using authentic double tufts, a stitch that gives unmatched craftsmanship and lasting durability. 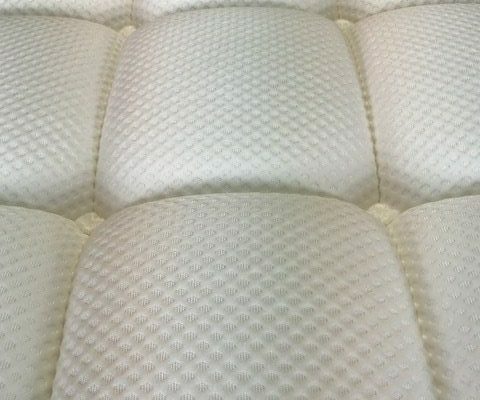 In case you don’t know, double tufting is a distinct process of affixing the mattress layers from top to bottom to create a unique mattress with both soft and firm feel. Apart from its first-rate composition, the cover is made more explicit with its golden hue and plush hand tufting. This impressive mattress will work great on any solid surface. The floor, platform slats, box spring or foundation and they now offer an adjustable base as well. It will work on an adjustable base but if you are looking to bend it a ton to site straight up, it might be a little thick to work with. But it will bend to a point just fine if you are looking for partial elevation. The DreamCloud aims as high as the clouds in its name, with 8 layers of premium bedding materials that combine to produce a weightless, serene sleep. The pocketed coil base is quiet enough to make you forget it’s there, but when you lay down on the mattress you will definitely feel the benefit it provides. The springs provide a support base for the multi-layered memory foam on top, allowing for better pressure-relief than purely memory-foam mattresses. 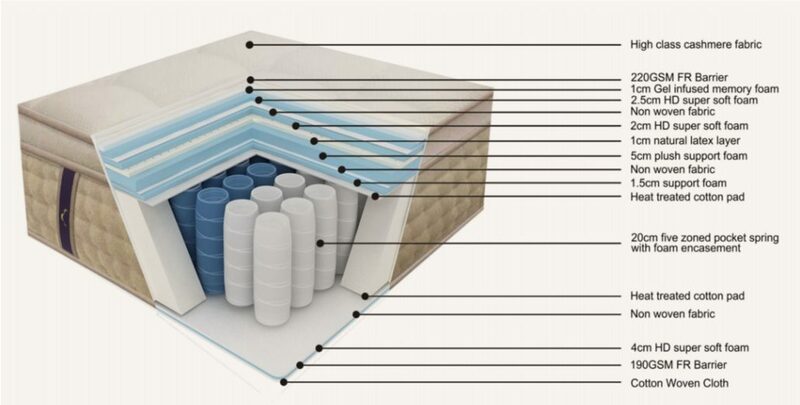 The coils are contained in 5 zones throughout the mattress, which means the right part of the mattress responds at the right moment, without bending and warping the entire surface. This can be felt the moment you sit on the mattress – it takes your weight comfortably without creating a giant sink-hole that makes everything roll towards you. DreamCloud advertise the mattress as a 6.5 on the firmness scale, which they describe as the sweet spot between too soft and too firm. This matches with the horde of online reviewers who praise the mattress’s ability to ‘hug you’, while still being firm enough to provide good back and muscle support. The first thing you’ll notice about the mattress is the tufted surface which actually resembles a network of little clouds. The ‘clouds’ on the surface are made out of a highly breathable, super-soft cashmere, and you will still feel the benefit of these even of you decide to use a mattress-protector. The DreamCloud can be used with any base, or no base. It can be used on the floor, on a slatted bed, and even on adjustable beds. 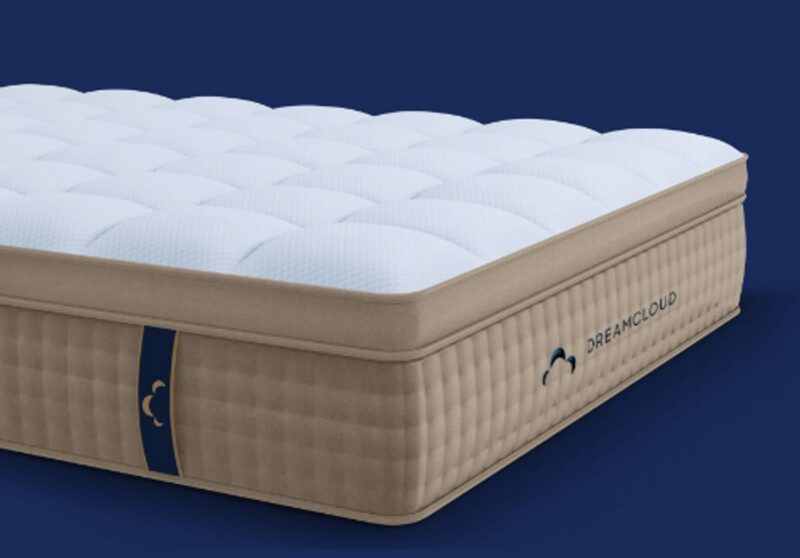 Overall, the DreamCloud delivers a level of comfort in line with its luxury reputation and premium price. While the amount of motion experienced on any given mattress will be subject to individual weight, the DreamCloud achieves a great level of overall stability while remaining responsive on the surface. The foam layers amount to 9.5 inches, with 2 inches of cashmere on top. The sheer amount of grip and friction created by these layers is key in reducing motion and sinkage. With the new Hybrid mattresses you get the motion isolation normally associated with memory-foam mattresses, combined with the structural bounce and strength of a spring-mattress. The DreamCloud is a pleasure to move around, whether you’re sitting, sleeping, working, or just propped up on your elbow watching the television. It easily supports a couple, with not much partner disruption. For those of you who allow your dog on your bed, the disruption felt by your pet’s movement will be kept to a minimum. It’s all well and good having a good mattress, but are you getting the whole mattress? A high edge support rating is a sign of quality, and means you’re getting the most bounce for your buck. You wouldn’t buy a set of curtains that only covered the center of the window, and you wouldn’t buy a bed that only functioned properly in the middle. With that in mind, the DreamCloud has incorporated an extra foam support around the edges. Meanwhile, the tightly bound nature of the foam layers on top of the springy coil means the entire bed is able to be used comfortably. Most common mattresses will suffer around the edges with prolonged use. But Hybrid mattresses have a leg up with their combination of foam and coils. The DreamCloud lives up to its premium reputation in terms of its edge support. There is no danger of rolling off the edge, or feeling hemmed in by weak edges on this mattress. 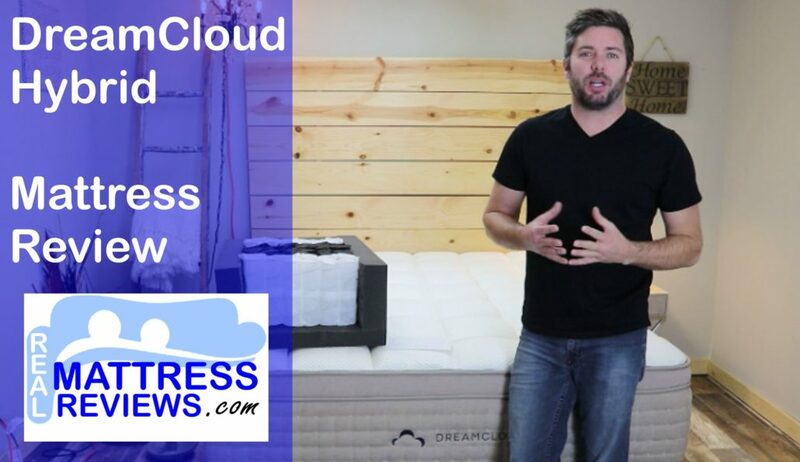 The DreamCloud is one of the most awe inspiring bed in a box options I have reviewed so far. At 15″ thick it’s surprising they find a way to roll pack it and sip it in a box and still use quality materials. DreamClouds sheer thickness and quality invokes luxury & for not much more than and less than many of their competitors. The DreamCloud Mattress impressed me for the following reasons. A.) The overall build and quality was above average. How much mattress is there is amazing and the fact that fits in a box is crazy! D.) It has been one of my favorite hybrid mattresses thus far. This is going into the top picks list for sure. E.) The handles make it easy to spin and move around. I recommend doing this very few months. F.) Lifetime warranty & 365 Night trial give you some peace of mind and is pretty much unheard of in the industry. This is a massive perk. Overall the DreamCloud is built extremely well for the price. It is a high end mattress with a fair price. 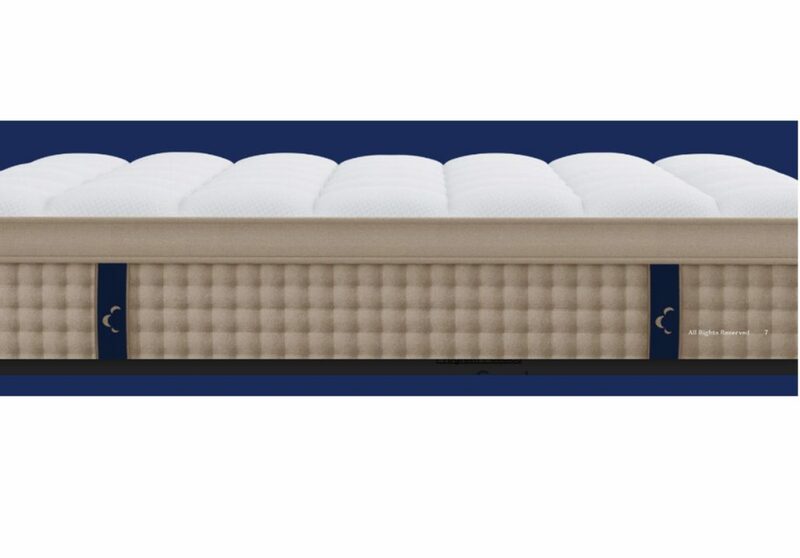 Additionally, it should work well for the majority of sleepers put there in terms of comfort and firmness level. I think this is also a great option for heavier sleepers too since its built very well and thick. 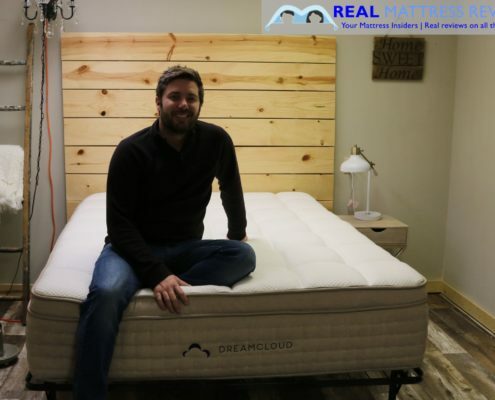 DreamCloud has stepped it up with the release of their mattress. It seems many of the new companies are doing so by coming out with more legit mattresses like a store would sell VS just a wimpy thin foam mattress. The DreamCloud is not super soft but still performed well for me. I generally like a soft mattress so I sink in a bit more but the DreamCloud still felt great for my weight 125lbs even though its not super soft. The mattress has a very high end look and feel. The cover is nice (although we cover it up with a protector and sheets). Being that I help Ross move these around all the time the handles on DreamCloud were a huge help for me. I would recommend anyone wanting to try a hybrid mattress. Those people who are looking for a legitimate mattress that is going to hold up should try it. It was very supportive, slept cool and there was not a lot of motion transfer when Ross moved around. It was definitely one of the nicest bed in a box we have experienced so far. not much to compare to I’ve never slept on a hybrid other than this. I’m not obsessed like everyone else is with this mattress but I do sleep well and have no complaints. good mattress. Temperature is one of the most important aspects that should be considered when buying a mattress. A quick glance at online review sites, for any mattress, will reveal that sleeping temperature is one of the most hotly contested issues. Thankfully, the DreamCloud takes this into account and utilizes a combination of technologies to ensure maximum temperature regulation and air-flow. A top layer of foam infused with cooling-gel works to absorb and dissipate heat without holding onto it. 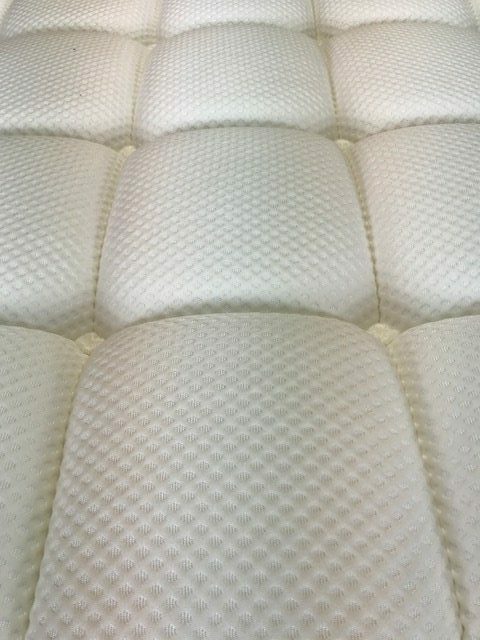 The latex layer, while mainly purposed to provide the comfort and responsiveness of the mattress, is also crucial in allowing for heat regulation. 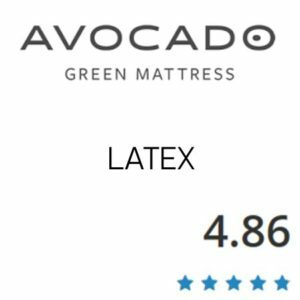 The latex is aerated and breathable, allowing heat to move uninterrupted throughout the mattress, without becoming trapped ‘between the sheets’. To top it off, the quilted cashmere cover is also highly breathable and makes air-circulation much more efficient. Also, it’s worth noting that since this is a hybrid, any heat contained within the mattress will also have a chance to escape via the coil-springs at the bottom. The DreamCloud excels in dealing with heat and regulating temperature. The manufacturers also clearly believe in this feature, as they proclaim it front and center on their website, where they urge customers to ‘Sleep cool’. As far as this review is concerned, the DreamCloud succeeds in keeping it cool during the night. Although we didn’t film the DreamCloud on a base you can be sure it will to a point. If you are looking to only elevate partially it will be fine. If you like to site straight up it may be a little to thick to perform the way you would like. When it comes to trials and warranty DreamCloud offer some pretty top of the range deals. They try to advertise themselves as luxurious suppliers for affordable prices – and they live up to their reputation. When you buy this mattress you receive a full 365 day no-risk trial, meaning you can keep the bed for the whole year round before you buy it, if you so choose. This safety period means you can lie on the thing for a whole year just to see if it is right for you, and you can’t really argue with that. Secondly, the DreamCloud team offer a lifetime guarantee on this product, meaning that for as long as you own it, it’s covered. They call it the “Everlong” guarantee, and if anything happens to your mattress they will replace it. Companies that offer this kind of warranty show a high level of confidence in their product, and it hints that these mattresses were built to last. Thirdly they offer a free one-time conditioning service after a year of ownership, where they will come out and clean the mattress for you professionally. This service remains available thereafter but you will need to pay for future cleanings. With all the perks of buying this mattress we felt it only fair to give it a high score. DreamCloud is a no stranger to the industry having another successful brand in the industry. The hybrid is a new launch for them and they set out to design one of the top mattresses you can buy online for a reasonable price. They have a hard to beat warranty, trial period and other perks to throw your way too such as free mattress cleaning etc. Save $200 Automatically with the link to the right.